When I bought my first road bike nearly eight years ago, I rode with a bike computer from day one, so I believe all female cyclists need a bike computer. My first computer was a just a simple one, that told me my basic statistics like speed, average speed, distance traveled, time, maximum speed and more, but it really helped me focus on making improvements. If you’re just riding down to the local shops and back, then a bike computer is probably a bit over the top, but if you’re riding your bike to get fit and want to improve then a bike computer is a great way to track your progress. You don’t have to spend hundreds of dollars. The most basic & simple computers cost from around $30 upwards. They get the information from a speed sensor attached to the front fork, that records the passing of a magnet attached to a spoke on the front wheel. These types of computers either use a wired or a wireless sensor. They do not allow you to transfer your ride data to a computer or tracking service, and most will not store individual ride details. In fact I used to transfer the data from my computer after every ride to an Excel spreadsheet to track my progress. About two years after I started riding I decided to upgrade my computer and was lucky enough to receive a Garmin 500 for Christmas. Most of the Garmin computers have a built in GPS receiver and are ANT+ enabled. ANT+ is an open standardised protocol used by hundreds of fitness accessory brands. For cyclists this means that you can pair it with heart rate monitors, speed & cadence sensors, and even power meters. Most of them provide you with all manner of data and allow you to set your computer up to display your preferred options. I like to focus on metrics like speed, average speed, time of day, elapsed ride time, distance, cadence, heart rate and temperature. But there are plenty of other choices with multiple screens and different numbers of items per screen. In fact, like most people, I don’t use my Garmin 510 to its full potential, but that doesn’t stop me enjoying using it. They also track your position using GPS, allowing you to not only see a map of your ride once transferred to a PC, but also to compare your time on established segments using a service such as Strava. You can see your time on a given climb or segment, as well as all the times of Strava users, and your current rank on that segment. I don’t personally use Strava but it’s very popular with cyclists. Some of the higher specified computers like the Garmin 1000 even have maps and provide turn-by-turn directions. These can be really helpful when you’re travelling in unfamiliar areas but for the average person who rides the same routes on a regular basis, it’s not so necessary. I can even use my Garmin computer on multiple bikes. In my case that’s three bikes. All I need to do is select the correct bike when I turn it on and it finds the sensors on that bike and off I go. There’s also lots of different mounts available for Garmin computers. The computer itself comes with basic mounts but you can also use ‘out-front’ mounts like the K-Edge I use on one of my bikes. There are also other bike computer brands around like Wahoo and Magellan but Garmin is by far the most popular. There are plenty of apps that you can download to use your smart phone as a bike computer. I prefer to use a dedicated bike computer and keep my phone in my back pocket, but if you don’t want to spend the extra money on a bike computer then it’s certainly an option. 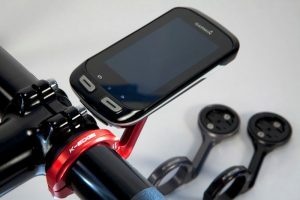 Topeak make some great bike phone case mounts so you can attach your phone to you handlebars or stem. All female cyclists need a bike computer to record their rides. What do you use? Share via comments or our Facebook page.